From 16 years onwards, the body condition of a horse slowly returns. The need for protein and phosphorus is increasing. Horses of 20 years and older need an adapted ration. Senior horses react more strongly to the change in ration in the autumn than younger horses. The chance of slimming in the winter is many times greater than in the summer. The reason for this is that grass is much better to digest than hay or silage. Grazing is therefore good for an old horse. The complaints that are going to occur, such as badly digested manure, too much water in the manure, poor hardening, a less good condition or some colicky symptoms can be played out. By controlling the horse as well as possible, slimming can be prevented with an adapted diet. Realize that with the slimming the horse has already received too few essential nutrients for a long time. The degree of wear on teeth and the position of the teeth differ per individual. Because older horses are likely to chew less vigorously, they can lose weight with apparently good teeth. The ration must meet the special requirements that the senior horse sets for the food. Normally you feed a horse mainly roughage with a supplement of concentrate. The senior also needs this for proper bowel function. In winter, the ration can consist of an easily digestible food (slobber) with sufficient fiber and structure. Replace the hay / grass silage with Gras-mix. This is short chopped so that the horses will not make balls of the roughage and they can take this product more easily. The concentrate feed must not contain too much starch and it must be made accessible for digestibility. Only switching to soaked concentrates or slobber of cornmeal and lumps is not enough and even dangerous. Avoid overfeeding with top sports chunks, because they unnecessarily burden the liver. The right diet can delay slimming in senior horses and improve resistance. 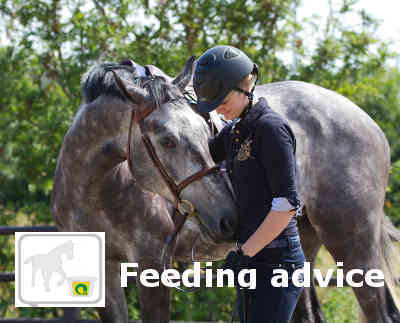 By being aware of the ration your horse can spend the last years of his life as fit and healthy as possible.